At the same time, I see significant differences between the ICRAC statement and the argument in the ARTG article. 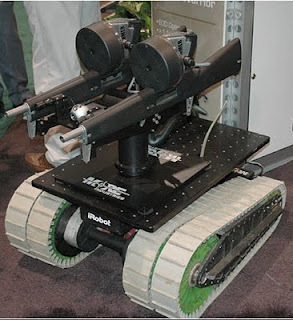 First, whereas ICRAC is concerned about the ability of weaponized robots to follow basic war law rules, ARTG suggests that “it may be anticipated that in the future autonomous robots may be able to perform better than humans [with respect to adherence to the existing laws of war].” This is not surprising since one of the ARTG authors is Ronald Arkin, who is pioneering designs for such a ethical soldier and has written an important book on the topic. Second, whereas ICRAC has floated prohibitions on some or all uses of autonomous robots on a menu of options, ARTG authors argue “it remains an open question whether the differences between LAR and existing military technology are significant enough to bar the former’s use” and moreover appear to assume such prohibitions would not, at any rate, check the deployment of such weapons: “the trend is clear: autonomous robots will ultimately be deployed in the conduct of warfare.” ICRAC’s position is far more optimistic about the potential of norm-building efforts to forestall that outcome, and far more pessimistic about the normative value of the weapons. But do these groups constitute nodes in a single epistemic network due to the shared causal and principled beliefs that the weaponization of robots is proceeding apace and that proactive governance over these developments is now a necessary public good? Or do they constitute separate, competing epistemic communities operating in the same policy space with very different visions about what that governance should look like? If the latter, do they indeed constitute counter-communities, similar to the counter-campaigns Cliff Bob is documenting in the NGO sector? Analytically, is there a standard for making this determination as an empirical matter or is it simply a matter of how one black-boxes the emergent norm under study? If I understand the “norm” in question as a precautionary principle in favor of some preliminary ethical discussion about AWS, then both these groups have a shared agenda whatever their different viewpoints on the ethics involved. If I focus on what they argue the outcome should be, my interpretation is that they represent different agendas (that may be true within each group as well, of course, as in any community there will be differences of opinion over outcome, process or strategy). I put this question forth largely as a bleg since I am not an expert in the epistemic communities literature and yet probably need to become one as I develop this particular case study for my book. Has someone developed a typology that I would find useful? Other thoughts or useful literature you can point me to?